PUBG’s snowy Vikendi map has been live for a little while now, and a handful of changes are on their way to help improve what’s widely considered one of PUBG Corp’s best efforts to date. As well as tweaks to loot spawn outlined in a recent update post, the Technical Test Server (TTS) has a whole bunch of major changes. In my opinion, the headline change is Vikendi’s new weather setting, which sets the clock forward a few hours. Moonlight will let you play at night, the entire map lit by a full moon and the captivating glow of the Aurora Borealis, localised entirely within your game server. 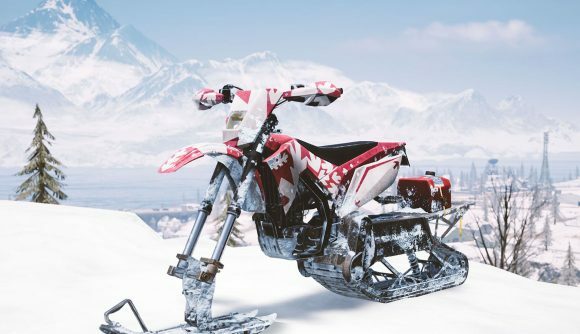 Vikendi’s also getting a replacement for the motorcycle, which has been swapped out for the snowbike, which is quicker and more mobile than the Snowmobile. While making your way across Vikendi’s snowfields will probably be easier now, the Snowbike is more fragile than its predecessors, meaning that it’s that much more likely to get absolutely shot to pieces by your opponents, cruelly denying you that Chicken Dinner. The two other major changes can be found across some of the battle royale’s other maps. A new SMG – the Bizon – will spawn on Vikendi and Erangel, but due to its lack of grip and magazine slots might not be great for long-range or elongated skirmishes. The other change is the long-awaited addition of Canted Sights as a new attachment. The scope can be attached to weapons with a secondary scope slot, such as the AUG rifle, the AWM sniper, the S12K shotgun, and the aforementioned Bizon. You’ll be able to toggle between your scopes, which circumvents the issue I always had when stuck with a single long-range scope. The TTS is currently also hosting an awful lot of changes to Vikendi’s loot drop rates. You’ll see fewer SMGs but more Assault Rifles, less level three armour and fewer snipers, but that’s far from an exhaustive list. These changes are still only in the works of course, and there’s no word on their arrival to the live game, but hopefully the latest update will prove a positive one.